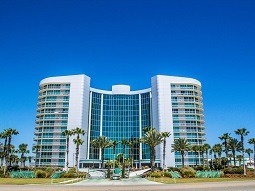 Bella Luna condo, beach resort home in Perdido Key. *This stunning 3 bed 3 full bath condo has a large balcony with breathtaking 11th floor views of Ole River, the bay and Ono Island. Condo has a deeded beach access. This condo has some of the best views in the entire building and on the island! Unit 1107 features a King bed in the master suite. The master bathroom offers a large Jacuzzi tub with a separate walk-in shower. The second bedroom features a queen and the third bedroom offers 2 twin beds. There is a sofa sleeper in the living room for additional sleeping. This unit will sleep 8 if the sofa sleeper is used. All bedrooms have attached bathrooms. There is no carpet in this unit. There is plenty of seating on the balcony to include teak wood lounge chairs. The unit has a full sized washer and dryer inside. Wireless internet access is provided. There is a large flat screen TV in both the living room and the Master bedroom. The blinds are controlled by a remote. There is a private walkway to the beach. The beach is stunning! Bella Luna Condo Rental in Perdido Key FL..